In my desperate bid to dismantle that mo-fo David Sedaris's lock on all things "best-selling," I am putting out the word to all my web pals: help me. If you have any suggestions about how to get the word out about my new book, "My Custom Van," let me know. Maybe you host a popular blog and would like an interview. I can do that. Maybe you pilot a skywriting airplane and want to volunteer your services. Super. Maybe you are one of the Presidential candidates and want to plug the title of my book into your stump speech. That's a great idea. Or maybe you just want to ring the doorbells of strangers to spread the good news like a Jehovah's Witness. I could come up with suggestions all day, but that would take the fun out of it for you. So join me. 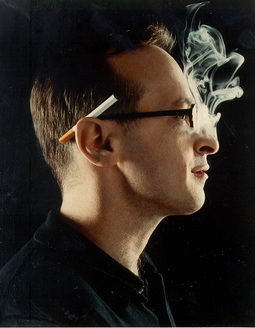 Together, we can defeat David Sedaris and send him packing back to his glittering life in Paris, France. P.S. Why does David Sedaris hate America? Changing big to bid before anyone else wakes up might help. Make a video mocking David Sedaris' wit and sexual prowess. Then let Youtube do the rest. your feud with sedaris is exactly why the gay community will always be divided... you need to learn to work together! "Make a video mocking David Sedaris' wit and sexual prowess. Then let Youtube do the rest." That's a pretty brilliant idea, actually. Like I said in an e-mail I just sent out -- this will be the greatest slap-fight in humorous essay publishing history. My blog is decidedly unpopular but maybe that's just the thing you need to put you over the top! I doubt Sedaris is trying that strategy. I say you change your name to 'David Sedaris' and beat him at his own game. I think once you've figured out how to blow smoke from your nose with an unlit cigarette tucked behind you ear, everything will fall into place. Actually,I may be trying to get a job at our paper and submitting a brief interview with a very famous celebrity may be just what I need to get the job. I scratch your back,you scratch mine? Oh, and it's Missouri’s fourth largest metropolitan area. @ Camille: The AP style book would have us write "Sedaris'" -- Strunk & White would have us write "Sedaris's." I prefer the latter, but for a paper your editor wants the former. I bet David Sedaris pays for his publicity. Another reason why I like you better. @Camille: Give it a decade or so, and I bet we'll have publishers and wire services dictating which smiley to use and whether or not it is appropriate to capitalize "LOL." Strunk and White will be spinning like lathes in their graves. I had two of Sedaris' books, "Me Talk Pretty One Day" and "Dress Your Family in Corduroy and Denim," both of which I cannot find. Now I need to know if you stole these books from me and if you did, if you could give them back to me. Your answer will either help or hurt you in your quest to defeat Sedaris. Hey Michael! We'd be happy to host a giveaway or do an interview on The Apiary. Let me know! Hey, you've got a ton of fans on Facebook. (Just search "Michael Ian Black" on there, and you'll see a whole list of 'em). Why not hit them up? Then, if you could get started on that YouTube video, I think we'd all be very happy. I am not usually one to readily admit my own ignorance, but I had no idea who David Sedaris was before reading this blog, if that makes you feel better. Of course, this may also mean you are unwittingly promoting your nemesis to others. I wish to hear from Courtney on this matter. While I have nothing against David Sedaris(his sister Amy is pretty funny),I would love to help your book with a bit of a blog push. I've interviewed several authors on my pop culture blog(also review books as well)such as Steve Almond and A.J. Jacobs and would gladly do an interview with you via e-mail(as long as you don't mind a couple of questions about being on Reaper). Either that, or just change your name to David Spedaris. I have a pretty small blog, but I think we could make something work. Let me know, if you do, I might even buy your book! We are all in need of a write-off competition between you and David Sedaris! Like Fight Club...except it will be called Write Club. I want you to write as hard as you can. Ummm Susanna.....you forgot the first rule of write club. You could also send out a myspace bulletin to your 6000+ friends right before it goes on sale. You could do it now,but I think most people don't like to wait and want instant gratification and will want to go right out and buy it on the spot. Yep.